New York's American Museum of Natural History is one of the most important natural history museums in the world. Founded in 1869 by a group of natural history enthusiasts including President Theodore Roosevelt's father, the museum has evolved into one of the world's largest natural history collections and research facilities. Throughout the years, the museum has attracted world-class research scientists. Among past affiliates are Margaret Mead, Franz Boas, and Roy Chapman Andrews (the inspiration for movie character, Indiana Jones). The Fossil Halls - The museum's two dinosaur halls house over 1 million species of fossils, the most spectacular of which are the reconstructed skeletons of the giant Tyrannosaurus Rex and the Stegosaurus. The Rose Center for Earth and Space - The newest part of the museum, this 120-foot high, 333,500-square foot space includes the reworked Hayden Planetarium, the Hall of Universe, the largest glass curtain wall in the world, and a myriad of exhibits about space, the planets, galaxies, and beyond. The Milstein Hall of Ocean Life - Home to one of the museum's most popular exhibits -- the 94-foot blue whale -- this section also contains dioramas of other marine and aquatic life, including dolphins, porpoises, and giant squid. The Cultural Halls - The museum's cultural halls explore the work of anthropologists Margaret Mead and Frank Boas, among others, and give insight into the cultures of South America, Africa, Asia, and the South Pacific, with replicas of villages, authentic artifacts, and other cultural information. 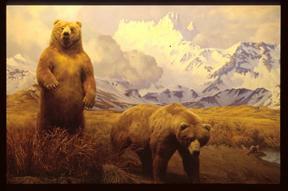 Bird and Mammal Halls - The bird and mammal halls feature a huge variety of local (New York), North American, and Global animals and birds in life-like dioramas, such as the bear exhibit pictured above. The museum's store is noted in New York City for its unique gifts and children's learning toys and gifts. There are dinosaur board games, umbrellas with the blue whale, and jewelry designed after native South Pacific motifs. It's well worth a visit. The American Museum of Natural History is easily accessible from all other New York City via taxi or subway. In fact, there's a subway station adjacent to the museum. The museum is located in New York's upper west side and is open daily from 10 a.m. to 5:45 p.m., except for Thanksgiving Day and December 25. In addition, the museum is open until 8 p.m. the first Friday of each month. Discounts are offered for seniors and students, and members and children under 2 receive free admission. Hungry visitors will find many dining options at the museum. There is a food court on the lower level, which serves salads, sandwiches, soft drinks, and coffee. In addition, Cafe on 4 features half bottles of wine and splits of Champagne as well as sandwiches, salads, and gourmet cheese plates. The Tapas Bar is open from 5:30 p.m. until 8 p.m. on the first Friday of each month and serves small, Spanish-style tapas plates, wine, and sangria, accompanied by live jazz.